The honey`s sweet, and so are you. In the courts of 18th-century England, the tradition of Saint Valentine`s Day evolved into an occasion where lovers expressed their feelings with flowers, confectionary and greeting cards, known as `Valentines`. And as the age-old saying goes, `Love never dies`. The Valentine`s tradition of celebrating your love, gratitude and appreciation of a partner, secret love or simply a beautiful friendship, has carried on through the generations. To this day it goes without saying that receiving a flower bouquet with a beautiful card message is guaranteed to make one feel wonderful, loved, valued, cherished and spoilt. Express your feelings and send flowers online to someone you care about this Valentine`s Day, with a bloom that speaks of romance, love, gratitude and desire. The florist team at Flowers for Everyone have designed a divine collection of romantic roses for Valentine`s Day to say `I love you`,` I like you`, `I like you A LOT`, `you`re the best`, `will you be mine`, or even `will you marry me?`. Whatever your message or intention for a lover or a friend, organise a flower delivery of fresh, romantic roses easily and conveniently this Valentine`s Day with our talented florists online. 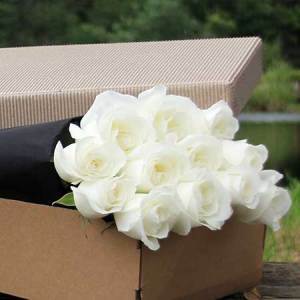 From single long-stemmed roses to a perfect dozen, Flowers for Everyone offer quality blooms presented in stylish signature wrapping and gift boxes. Alternatively order a show-stopping flower arrangement of roses en-masse in an elegant vase. Va-va-voom! Why give red roses at Valentine`s Day? The language of flowers is steeped in tradition. The red rose symbolizes love, beauty, courage and respect, romantic love, sincere love, and passion. It is no wonder receiving a bouquet of red roses says `I love you`! Alternatively, our long-stemmed classic white Valentine`s Day roses speak of purity and innocence, youthfulness, secrecy, `I am worthy of you`, humility, and reverence, whilst our pretty pale pink roses express appreciation, grace, perfect happiness, `thank you`, `please believe me`, admiration and gentleness. Say it with roses and order flowers online this Valentine`s Day with Australia`s most popular premium online florist.